How often do children hear: "Can you find something to do for the next hour?" or "How about making something with these art supplies?" Powerful learning can happen when children are given the chance to come up with their own way to occupy a rainy day, to invent a game or to fill a blank page with their ideas. But in today's heavily scheduled, digital world, are children engaging in child-led, unstructured play? And do parents recognize how child-led play benefits their child's development? To discover the answers, global toy company Melissa & Doug partnered with Gallup on a nationwide study of U.S. parents of children 10 and younger. 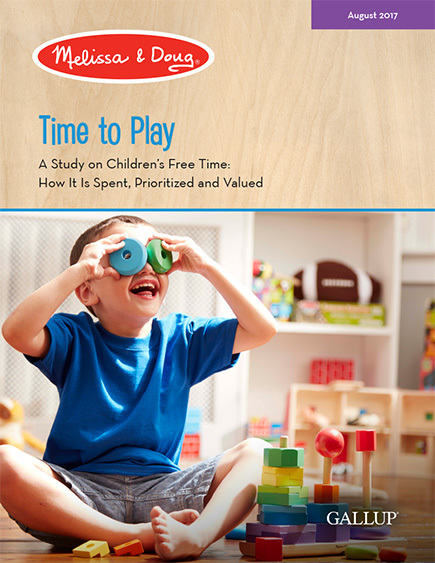 Now available: Download the Screen-Time Findings Summary for a detailed view of children's screen-based play. To receive an email with a link to download this report, please fill out the form below. Someone from Gallup will receive this information and may contact you via email or phone about your interest in this topic and other Gallup products and services.